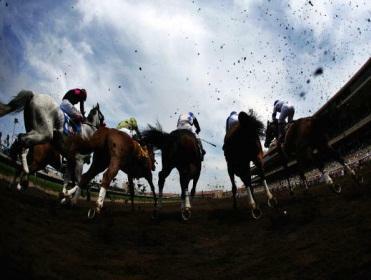 Graeme North assesses the action at Monmouth. "With neither Hymn Book nor Pants On Fire the force of old, the Monmouth Cup looks at the mercy of Take Charge Indy who paid the price for trying to stay with Fort Larned last time..."
There is an excellent if stamina-sapping card at Monmouth on Sunday when the New Jersey venue hosts five Graded events on a marathon fourteen-race programme including one of the summer highlights for three-year-olds, the G1 Haskell Invitational (off 18:18 local time, 23:18 BST) over nine furlongs on the main track. Seven are declared, though that number might shrink to six if Vyjack takes up his alternative engagement in the Jim Dandy at Saratoga on Saturday, and as in the Jim Dandy 2013 Classic from will be put to the test with Preakness winner Oxbow and Derby runner-up Golden Soul going head to head. Oxbow (who was sixth in the Derby after compromising his chance by racing too close to the strong early pace) has since finished second in the Belmont where Golden Soul looked a non stayer but unlike the Preakness or the Belmont he won't be going off a double-figure price now his ability has belatedly been acknowledged. Three of Oxbow's four wins have been accomplished post to wire but seems likely to relinquish the lead on this occasion to Verrazano whose only defeat in six races so far came in the Derby when he raced even closer to the suicidal pace than Oxbow. Given six weeks off, he rebounded with a win here in the G3 Pegasus where he drew right away to win by over nine lengths and over what might well be his ideal trip he receives a useful 2lb from Oxbow. Power Broker is a significant shipper from California given that his trainer Bob Baffert has won the last three runnings of this race. He won a G1 at Santa Anita last September and was impressive taking a non-graded stakes at Belmont last month from the front, and in receipt of weight from Oxbow and Verrazano wouldn't have to improve by more than a couple of pounds. With Verrazano forecast to start at 2.8, Oxbow at 3 and Power Broker at 4, however, the market looks to have this one covered. Kicking off the Graded action at Monmouth is the G3 Matchmaker (13:50, 18:50 BST) for fillies and mares over nine furlongs on the turf. Naples Bay heads our ratings in this one from Minakshi and Channel Lady and though she wasn't at her best last time out in a much stronger G3 than this at Parx that effort can be put down to the yielding turf. She probably needed her reappearance before that in the Beaugay at Belmont after seven months off and the combination of her third run back and return to fast ground should ensure she goes very close. Laughing won this race last year and comes here after winning the G3 Eatontown last time but might well struggle to concede 5lb to all bar Channel Lady. The Morning Line 13 for Naples Bat is way too big. Hot on the heels of the Matchmaker is the G2 Molly Pitcher (14:20, 19:20 BST) for fillies and mares over a mile and sixteenth on the dirt. Only six go to post but they include Funny Proposition who beat a below-par Royal Delta last time out (when the re-opposing Wine Princess was well beaten) as well as Joyful Proposition who started this year off with a bang winning the G1 Santa Margarita Invitational at Santa Anita but needs to put a modest run at Belmont behind her when unable to dominate on the front. That scenario might play out here too with regular frontrunner Lady Samurai in the field as well as Funny Proposition. This looks a particularly tricky affair. The other two Graded races are the Monmouth Cup (G2, 15:56, 20:56 BST) over the same surface and distance as the Molly Pitcher and the Oceanport (G3, 17:36, 22:36 BST) over the same trip on the turf. With neither Hymn Book nor Pants On Fire the force of old, the Monmouth Cup looks at the mercy of Take Charge Indy who paid the price for trying to stay with Fort Larned last time but prior to that had turned in two high-class displays at Churchill Downs and Gulfstream. On those pieces of form and with the added bonus of a likely ideal stalking trip he is the one to beat even though he has to concede upwards of 5lb all round. Eleven go to post for the Oceanport in which 3lb covers the seven highest-rated runners on weight adjusted figures and they don't include Two Notch Road whose third place two runs back in the Monmouth Stakes behind Boisterous and Big Blue Kitten would entitle him to plenty of respect if he hadn't run so poorly last time again at big odds in the Colonial Turf Cup. Silver Max will probably make the running as usual but he looks likely to get pressed for the lead and that might only set things up for one of those ridden more patiently. Hudson Steele and Change of Command might be the pair to benefit. They met here in June in the Da Hoss Stakes where there wouldn't have been much between them had Change of Command not been hampered by Hudson Steel turning for home. Hudson Steele was having his first run for nearly a year, however, and the 2012 G2 Dixie winner looks the one to beat despite a small turnaround in the weights given that he looked to have a bit up his sleeve at the finish. With Silver Max looking a poor favourite, the Morning Line 7 is generous. Tried our new US site? Click HERE to find out more.